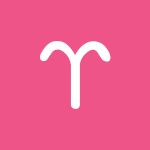 The Moon is in Virgo until 9:12 PM, after which the Moon is in Libra. The Moon is waxing and in its First Quarter phase until 5:30 AM, after which the Moon is in its Waxing Gibbous phase. The First Quarter Moon occurred on the 22nd, and the Full Moon will occur on April 29th. Mercury is in its post-retrograde shadow until May 3. **Times are Eastern Standard Time (EDT). 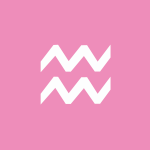 Things are really heating up in your career or regarding your responsibilities, dear Aries. Your ambitions to meet or exceed a goal are going strong, and the pressure is on as Mars and Pluto align at the top of your solar chart. You want to do things your way, and you can be quite masterful in a leadership role now, although this is not without its potential problems. You seem to have extra courage to reach the top. Try not to wear yourself out in the process! This is a powerful time for making your mark and going after your goals with gusto. For some, this can be a time of intensity in your career or with your reputation. You might feel scrutinized, but feedback may very well fuel your ambition to improve. Taking your ego out of the equation can be most helpful now, although not very easy! Try to top your own previous performance rather than worrying too much about what others are doing. This can be an excellent time to approach a project in an entirely new way or to begin a new, ambitious project. If you channel your energy well, you can get a whole lot done, particularly when it comes to revitalizing something important to you. Try not to waste this opportunity on battles and frustrations. Mars and Pluto align and harmonize with your sign today, dear Taurus, and you might consider this a power boost. You’re in a stronger position to go after what you want. You might discover or develop a personal interest or course of study with this energy. It’s a fine time for promoting yourself or your work as well as for learning or advancing in your trade. For some, a compelling experience may happen now that changes your perspective. The goal should be to purge and let go, responsibly, if you’re seeking out or defending a truth today. While this can be a strong time for getting an answer, things can get heated and intense pretty quickly, so it’s important to be mindful of where you put your energy. Similarly, stubbornness can be a positive when it involves working towards an important goal, and counter-productive when you shut yourself down entirely to possible alternatives. Watch for over-defending an opinion. It can be a good time for making significant changes to educational, legal, and travel plans, or for building brand new ones based on newly discovered passions. 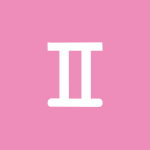 You’re in an excellent position to get to the bottom of a matter today, dear Gemini. Mars and Pluto aligning in your solar eighth house suggests profound emotions, intensity in a relationship, or the need to make significant changes. You can be extremely focused when it comes to eliminating something unhealthy from your life or uncovering important truths. It’s a powerful time to break free from a bad habit, and intimate relationships can turn a corner and transform now. If you’ve been frustrated with a situation, it may reach a head, and you’ll want to do something about it, particularly if you’ve been over-attached to a person or situation. You may decide to commit to a lifestyle change based on current circumstances in your life. There is bravery about what you are prepared to face, but you may push things too far. Financial pressures are possible now, making it necessary to identify areas that need to change. Relationships can really heat up, and issues of trust can be in strong focus. 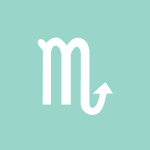 There is intensity in relationships now, dear Cancer, with Mars and Pluto joining forces in the sign opposite yours. Something has to change, and it’s best to recognize this and work with the energy rather than fight it. You are attracting intense energy into your life through your relationships. It can be a time of fierce competition or difficult people trying to get the upper hand in your life for some of you. Issues of trust may be at the root of conflicts or reunions. However, any disputes between you and someone close to you that have been stewing for some time can emerge now and demand action, and avoidance isn’t an option! Frustrations and difficulties can escalate quickly, mainly because the mood is dense, sensitive, and complex. There may be some tough decision-making or pressure that forces an issue. Aim to be strong within yourself so that you can project this strength outward, as people around you can be trying to get their way or could be more forceful and assertive than you. 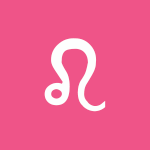 There is powerful energy in your solar chart related to the areas of work, service, and/or health and self-care efforts, dear Leo, as Mars and Pluto align today. Changes are essential, and while tension can run high, this can help push you to new heights.The determination to meet or beat a goal is strong, perhaps to obsessive levels! You might decide to eliminate habits in your routine that are counter-productive so that you can focus on those that serve your greater goals. Watch for power struggles with others, as the general atmosphere today inclines people to extremes in their attempts to gain some control over their own lives. If you let frustrations overwhelm you, you are wasting this powerful energy that is best harnessed and channeled into productive work and goal-setting. Passions and ambitions intensify now with Mars conjunct Pluto today, dear Virgo. Fortunately, this alignment occurs in harmony with your sign, and this helps you make the most of it. You can become very single-minded now, and if you channel this well, you can move mountains. Where extremes are not appropriate and possibly destructive, they should be avoided. You may have the chance to zero in on a problem or perplexing matter now, and this tunnel vision can help or hinder you, depending on how you decide to manage it. Obsessive thinking is not going to do much more than stress you out. However, if you can identify the deeper problem that is driving any compulsive behavior or thinking today, then you also have a chance to face your fears and do something about them. You may experience a strong desire to gain more control over your life, and you’re ready to go out on a limb now. There is intensity brewing in your personal life now as Mars and Pluto come together at the bottom of your solar chart, dear Libra. You may be dealing with issues of trust, or complicated emotions are in focus. You may get the chance to channel excess energy into a project around the home or for/with family, and you can be determined to make a difference or a significant change or transformation. The focus should be on renovation, whether this is literal or figurative. This Mars-Pluto aspect can challenge you to confront, manage, and handle emerging issues that have been buried, swept under the carpet, or otherwise hidden. Avoid the pitfall of expecting immediate changes and results. Aim to start working on problem areas now, and avoid going head to head with people over superficial issues, as this will get you nowhere. Patience and deliberate action will reward you. Your rulers, Mars and Pluto, come together today, dear Scorpio, and this is a powerful combination of energies that brings a feeling of urgency to your life. You are not afraid to stir up some controversy now, and your manner can be quite provocative. There can be a tendency to push too far or to test yourself and your limits. You might be thinking of something obsessively. Keep in mind that gaining more control over your life doesn’t mean knowing all or controlling others, but is about managing your own behavior and actions. Channeling this energy well, you can also be highly productive when it comes to taking action on matters that you’ve previously only been thinking about. You can find yourself thoroughly absorbed in a pet project or with studies and ideas, and ambitiously chasing a goal. Your powers of persuasion are even stronger than usual now. 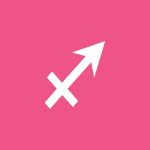 Mars aligns with Pluto in your resources sector today, dear Sagittarius, and there can be intensity revolving around a money matter or question of values. You may need to make a decision or a significant change. Emphasis should be on turning a situation around, and knocking something down and rebuilding may be the ticket. Draw on your determination to make improvements. This is an excellent time to eliminate expenses and to rework a budget. Business matters can benefit as you have a real sense of what truly matters, and you’re better at parting with those things you no longer need. There may be some power struggles with others if you feel undervalued, however. If you’re getting frustrated or angry too quickly, consider that gaining more control over your life and your material resources may be at the root, since you don’t want to feel at anyone’s mercy. What you make, own, and believe in can be sensitive topics today, but you can also discover a whole lot about yourself and your fears if you explore these things more deeply. 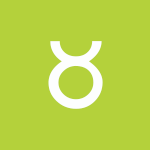 Mars and Pluto align in your sign today, dear Capricorn, and this can be a time of great personal passion, power, ambition, and influence. You might want to aim to use these powers constructively and enjoy the courage to meet and then beat your goals, but do watch for a tendency to come on a little too strong or to push yourself too hard. This can also be a time when people are looking to you to lead. You can feel super-motivated to reach a personal goal. It may be empowering to embrace your desire to go after what you want. It’s a day for having a huge say in what others think of you, as the power to shape your image is strong. You can come to sudden insights that help you do so. Work on self-improvement and self-control for amazing results now. Today’s energies are intense as Mars and Pluto align, dear Aquarius, and this may point to a personal dilemma or challenging decision. Watch for deflecting the blame or tense behavior with others. Aim to get in touch with deep desires and confront them. There can be a lot going on beneath the surface today, and there can be some fixation on past events, guilty feelings, or missed or lost opportunities. Buried or hidden matter can emerge, possibly in a disruptive way. Self-honesty is essential to manage your emotions and move forward feeling refreshed and purged. If you find yourself obsessing over past mistakes or otherwise attracted to things that you know have the power to bring you down, try to pull yourself out of it. The focus now should be on letting go and releasing rather than building up more frustrations and resentments. 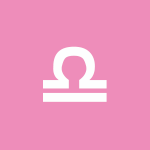 This energy can point to intense, exciting connections, personal revelations, and projects that motivate and thrill you. 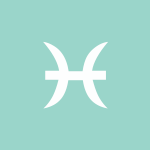 A Mars-Pluto alignment occurs today, dear Pisces, and the day is likely to be on the intense side. Something in your life is in need of an overhaul, and the good news is that you have the courage to take action! A major project can be all-consuming now. Tensions with a friend or competitor can rise, however, as feelings can be complicated and interactions can be intense. You could be in the position to make changes to your circle of friends, and decisions can be tough. However, there is a “cleaning up” energy with us now that ultimately brings us to a stronger place. Outworn attitudes and activities that no longer serve you well may need to be left behind. Strong feelings for or about a friend, group, long-term goal, or cause can be in focus. Although you may have a strong desire to know the truth of a matter, try not to push too far. Power doesn’t come from knowing all, but rather from knowing yourself and being honest with yourself. Above are astrological event highlights for the day. Full Horoscopes are at Cafe Astrology. 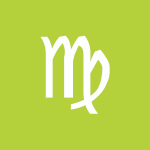 If Your Birthday is April 26th, If Today is Your Birthday full horoscope here. 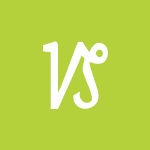 We are imaginative, creative, and communicate warmly and considerately. This is a good time for both teaching and learning, and for expressing feelings. Researching cooking, health, and nutrition can be fruitful now. It’s also a strong time for marketing. We have energy fit to burst and it’simportant to direct it into positive pursuits. We may need to push to get results, but this should be done within reason. Strategize and make intelligent choices. Actions now will have results. We may not be in strong touch with reality right now. There is a tendency to illogical, deceptive, or convoluted thinking. Moon 135 to 180 degrees ahead of the Sun. We are looking to attach value and meaning to our goals. This is a time for analyzing, questioning, perfecting, and improving. 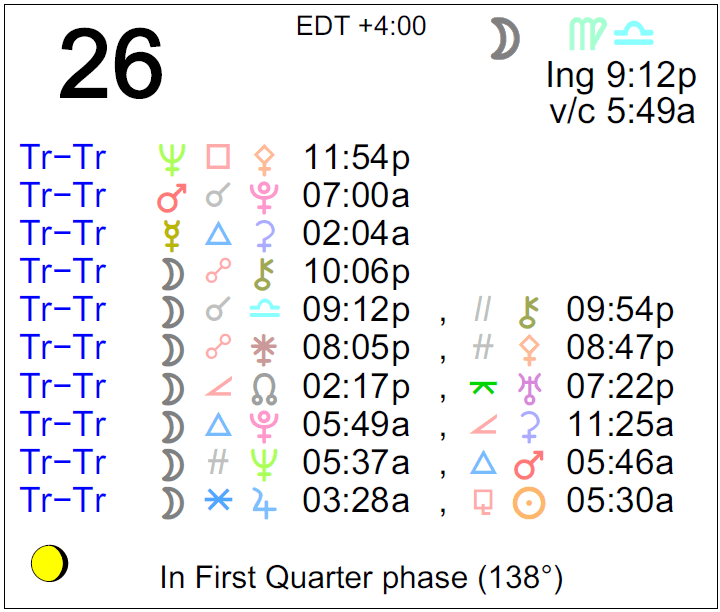 We have an emotional need for order with the Moon in Virgo. Diet, nutrition, health matters, work, and routines are in stronger focus. If we’re feeling out of sorts emotionally, we might also experience symptoms on a physical level now. Sabian Symbol: A flag at half-mast in front of a large public building. We tend to seek out harmony, balance, and beauty. Love, romance, decorating, beauty treatments, the arts, creative pursuits, parties, dates, and recreation are generally favored now. There is increased sensitivity, affection, and warmth, but there could also be some appeasement, tact, and diplomacy. Feelings and desires seem to be in sync, making this a good time to take purposeful action. Healthy competition, resourcefulness, courage. We can be quite focused now, driven by our goals and ambitions and motivated to put problems behind us. We might happily pour ourselves into a current passion or interest, and could find it easy to get to the bottom of things. We may be projecting our own issues onto others now, and could be defensive or feel that others are insensitive to our feelings and needs. We might experience a conflict between wanting to be close to others and desiring to prove our independence, making intimacy a challenge right now. Sabian Symbol: A woman of samaria comes to draw water from the well. We are taking pride in our responsibilities or performance. This can be a time of steady progress and increased self-discipline. We are more inclined to humble ourselves to authority or good advice, and tend to employ traditional methods. You are a rebel but also a leader. You are innovative and original. Others may see you as arrogant, wilful and disruptive at times. Life will be full of surprises. Politics, science or computing appeal to you. You are an independent thinker. You talk quickly, and like to think up new ideas. You may experience flashes of intuition. Sabian Symbol: A scholar creates new forms for ancient symbols. Critical thinking that can skew to overly negative, rigid, nit-picky, or narrow. Communications are guarded and unnatural, not flowing. There can be delays or frustrations getting from point A to point B, and getting our message across. A time for editing. You are curious and flirtatious, and enjoy intellectual relationships with exchanges of ideas. Communicating within a relationship is important to you. You can be restless, and sometimes gets bored. You may have many money-making schemes. 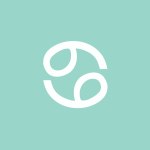 Sabian Symbol: The garden of the tuileries. You are a caring and loving partner. You understand your partner’s struggles. You will pursue your personal desires in a responsible and methodical manner. You have strong ambitions, and may be domineering if threatened. You can create opportunities to achieve your personal goals. You will always be able to find the energy level you require. You are resourceful and have a pool of enormous energy available when needed. You also have strong desires and a volcanic temper. You are on an intense search for the truth. You have strong desires for sexual union and joint enterprises. You could be a transformative teacher. Sabian Symbol: An albatross feeding from the hand of a sailor. Sabian Symbol: In a quite moment, the flow of inspiration. You place importance on structure and order in the workplace. You have great discipline and personal ambition and can succeed in administrative and management positions. Workers will turn to you for a sense of stability and authority. You have a keen mind able to grasp many concepts. Therefore you are adept both in written and spoken language. Sabian Symbol: Two dutch children talking. You want to be at-one with the world through your relationship. You crave for the highest romantic ideals within your relationship, and become disillusioned with reality. You feel cared for when other people play with you and praise you. You like to show others you care for them by encouraging their creative talents and sense of fun. Sabian Symbol: Early morning dew. Sabian Symbol: An evening lawn party. Cnj 08°Cp33 FACIES — Ruthlessness or the victim. 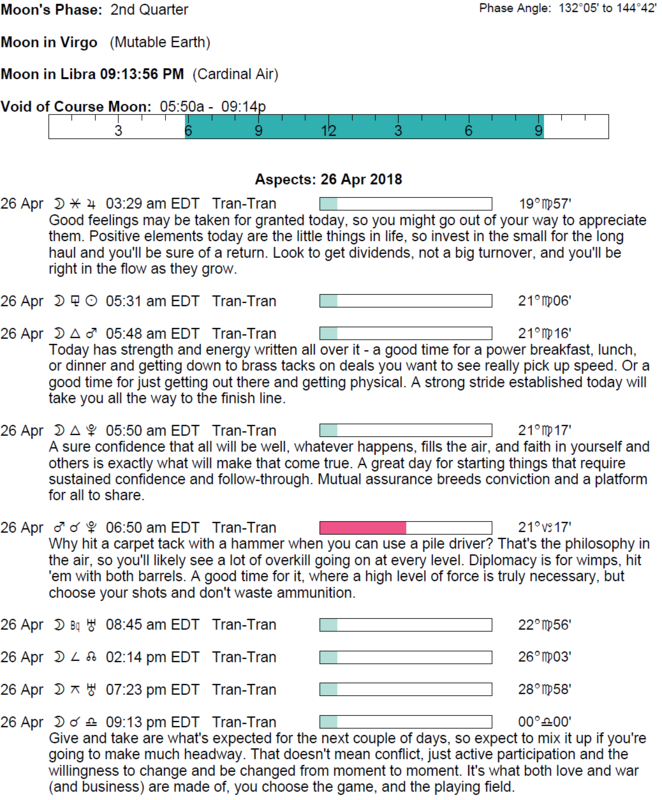 Cnj 15°Pi33 ACHERNAR Risk of rapid endings. Sun 03° Taurus 56' 34"
Moon 05° Capricorn 49' 44"
Mercury 09° Aries 36' 52"
Venus 04° Aries 31' 49"
Mars 15° Gemini 53' 20"
Chiron 03° Aries 42' 27"